July 20, 2014 – BWF: V8 defeated Maverick. July 24, 2014 – BWF: V8 defeated Maestro. July 25, 2014 – BWF: V8 defeated Victor Boer. July 26, 2014 – BWF: Acce defeated V8. September 7, 2014 – BWF: V8 defeated Acce. October 11, 2014 – BWF: Beto defeated V8 by disqualification. October 18, 2014 – BWF: V8 defeated Rapha Luque. November 14, 2014 – BWF: Sinner defeated V8 in the 1st round. November 15, 2014 – BWF: Beto defeated Acce and V8 in a 3-way match. December 21, 2014 – BWF: Dante and Max Miller defeated Insano Igor and V8 & Acce and Beto in a 3-way tag team match to retain the tag titles. February 24, 2015 – BWF: Tim Anderson defeated V8. March 29, 2015 – BWF: V8 defeated Rapha Luque. July 18, 2015 – BWF: Bad To The Bone (Insano Igor and V8) defeated Luchas Sensacionales (Speed and Victor Boer). July 19, 2015 – BWF: V8 defeated Sonico to win the BWF Rei Do Ringue title. September 7, 2015 – BWF: V8 defeated Sonico to retain the BWF Rei Do Ringue title. Cezar Bononi signed a WWE contract in 2015. February 6, 2016 – NXT Live Event: King Constantine and Thomas Kingdon defeat Cezar Bononi and Kenneth Crawford. April 9, 2016 – NXT Live Event: Sawyer Fulton defeated Cezar Bononi. June 3, 2016 – NXT Live Event: Cezar Bononi defeated Bronson Mathews. March 3, 2017 – NXT Live Event: Cezar Bononi defeated Kishan Raftar. March 11, 2017 – NXT Live Event: Dan Matha defeated Cezar Bononi. April 28-29, 2017 – NXT Live Event: Aleister Black defeated Cezar Bononi. May 5, 2017 – NXT Live Event: Cezar Bononi defeated Demetrius Bronson. May 6, 2017 – NXT Live Event: Dylan Miley defeated Cezar Bononi. May 10, 2017 – NXT: Aleister Black defeated Cezar Bononi. May 13, 2017 – NXT Live Event: Cezar Bononi defeated Tian Bing. May 26, 2017 – NXT Live Event: Aleister Black defeated Cezar Bononi. May 31, 2017 – NXT: Cezar Bononi defeated Andrade Almas. July 26, 2017 – NXT: The Velveteen Dream defeated Cezar Bononi. August 12, 2017 – NXT Live Event: Cezar Bononi vs. Kona Reeves ended in a no contest. September 5, 2017 – NXT: Andrade Almas defeated Cezar Bononi. November 8, 2017 – NXT: Velveteen Dream defeated Cezar Bononi. December 9, 2017 – NXT Live Event: Dan Matha defeated Cezar Bononi. January 16, 2017 – NXT Live Event: Babatunde Aiyegbusi defeated Cezar Bononi. February 15, 2018 – NXT Live Event: Cheng Yuxiang and Tian Bing defeated Adrian Jaoude and Cezar Bononi by disqualification. February 28, 2018 – NXT: Adam Cole defeated Cezar Bononi. 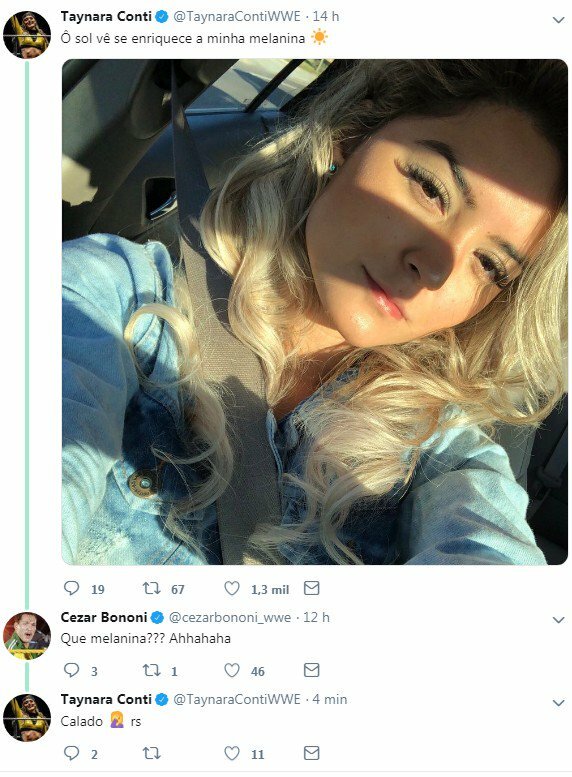 A Superstar @TaynaraContiWWE posta foto com legenda de sucesso de @VitorKley e é trolada por @cezarbononi_wwe.